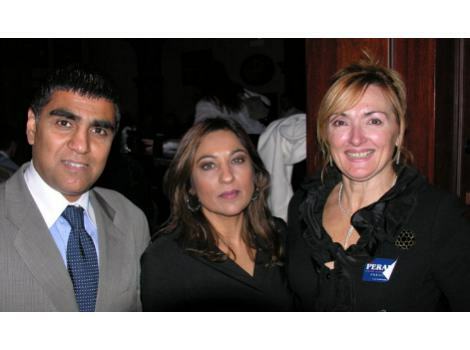 Salman Aftab Chicago 50th Ward Alderman? Bernie Stone has competition for alderman of the 50th Ward. Salman is pictured with members of Tony Peraica’s family. Salman has a web site, click here http://http://www.salmanforalderman.com/. Salman is very well educated and approved by Illinois Committee for Honest Government. The Frank Avila family are endorsing this candidate. Good luck Salman. Photo by Patrick McDonough. Please note for the record that Mr. Aftab has NOT at this point in time been endorsed by the Illinois Committee for Honest Government in his aldermanic race. We have yet to take a position in this race. We have stated some positive things about Aftab, including his drive and community service. We have also stated positive things about the incumbent Alderman, Bernard Stone, including his efforts on behalf of the Chicago Access Network the last time someone tried to screw around with CAN-TV. An endorsement by the Illinois Committee for Honest Government in this race is not expected prior to the close of the petition filing period in December. I could only hope that any committee commited to promoting honest government would recognize Stone’s staff commiting election fraud last Tuesday, as chronicled by the Chicago Tribune. Not to mention taking on 33 years of Alderman Stone’s corruption requires nothing but honesty. I’d like to add for the record that on November 6 Salman Aftab filed a verbal assault and threats police report against an Alderman Stone staff member who was riding with the Streets and Sanitation supervisor for the 50th ward. The police report was filed in response to, on that day, the staff member and supervisor threatening shop owners on Devon Ave to take down Mr. Aftab’s signs for candidacy — while on duty (dressed in uniform and driving the Streets and Sanitation SUV). A complaint was also made at the Inspector Generals office. While an apology was later made, it’s but a glimpse into how Alderman Stone runs his campaign. Is this the same Salman Aftab? honored by the Illinois Committee for Honest Govt. are invited to attend my birthday celebration and announcement on Friday the 24th at 11:30 at What’s Cooking Restaurant 6181 N.
Yes, it’s the same Salman Aftab. The incident that which you referred, represent a snap shot in time over the 20 years that Mr Nasim and I have been close friends. A sign of true friendship is being able to overcome misunderstandings and continue to remain close friends. Mr Nasim was one of the key note speakers at my fundraiser on August 8th, 2006. Mr. Anonymous: A true man takes responsibility of his actions and puts his name to his words. A funny thing happened on the way to the 32nd Precinct polling place ain the 50th Ward last Tuesday, when voters were asked to a sign a sheet of paper before voting in the general election. “There were some men sitting at the table who said they were just keeping track of who voted in the 50th Ward,” said West Ridge resident Wendy Mathewson, who voted that morning at St. Henry’s Catholic Social Center. When Mathewson and another voter looked more closely at what they were being asked to sign, they saw that it was a petition to put Ald. Berny Stone’s (50th) name on the ballot in the next citywide election. “There was a lot of resistance and anger, and denial of what was happening,” said Mathewson, an associate pastor at Northminster Presbyterian Church in Evanston. Tom Leach, a spokesman for the Chicago Board of Elections, confirmed that an investigator was sent out to St. Henry’s after receiving a call from the Illinois Attorney General’s office. “The investigator told the guy to stop because it was electioneering,” Leach said. Alderman Stone, how was your super cool birthday party the day after Devon Avenue was burned to smithereens? You weren’t even there! You haven’t even made a statement! All you care about is being King of the neighborhood. How many people came to kiss your ring that day? Didn’t look like many from what I saw on TV. Naisy received excellent coverage today for her petition filing. Mr. Aftab is first and foremost a fraud. He has claimed that he was endorsed by Randall Sherman although he never was. whatsoever to promote a favorable and effective campaign for the 50th ward. He merely surrounds himself with elected officials and adulates their ego to supplement for his backward and crude ways. And because he has trouble speaking English, it only adds to debacle of his platform. Mr. Aftab is a meathead. He has know formal training or experience in politics; his education is suspect as he never provides us with his background; he claims that he is the editor of some Afghan news service, the Director of IT at a consulting firm as well as a journalist. How on earth do you juggle such hectic activities!? Furthermore, I have yet to see anything that he’s written with a byline credited to him for a respectable media outlet. He proposes a lot of solutions to the growing issues in and around West Devon, but doesn’t support it with corroboration. His suggestion to improve schools and diminish gang activity is stating the obvious. Who doesn’t want to provide that for their children? But how do you plan on paying for the expenses? One would assume that if you went to his website, you would receive legitimate answers. But there isn’t anything except the same old slop on his visions and dreams. In addition, he has an arrest record as well as instigating verbal and physical altercations a dozen times, i.e. Pakistan Independence Day in Arlington Heights, Summer 2006. This man is clearly an idiot if he thinks he can just waltz into this campaign and assume that the honest people of West Rogers park are going to pick someone who moved to this country just 10 years ago. Honestly people, is this someone who you want to represent you in the community ? I think not. So much hate directed at Sal, he must be doing something right. I guess when someone is really the jackass of the race its pretty easy to poke of them. i believe that this administration is completely corrupt and they dont care for people’s trouble with gas prices, with governemnt lying and sending kids to irak, torturing innocent people and irs taking whatever they want to take form hard working people. All i can say is that aftab is a jackass,he just got arrested on march 2008 when Mr: khan pressed chargers against him for phisicaly attaking him and causing criminal damage to his cab. Looks like he got into more trouble.